Cavalier India, Lucknow is going to conduct the Hunar All India Scholarship 2019 Exam in the upcoming days for all those students who are studying class 9th, 10th, 11th, 12th. This scholarship scheme for all those students who want to join Indian defense forces but need their financial aid to complete their continue their dream. The objective of Cavalier India’s Program Named “Hunar” is to financially help the students to complete their higher education. Hunar All India Scholarship Exam 2019 is one of the best competitive exam conducted by Cavalier India, Lucknow. Cavalier India. It is the no. 1 defense academy which provides SSB interview training to the capable candidates, If you are also one of the eligible students then fill scholarship registration form before the last date through the link which is mention at the bottom of the page. This scholarship scheme is eligible for class 9th, 10th, 11th and 12th class students. 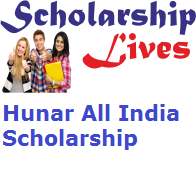 Hunar All India Scholarship Exam 2019 provide the scholarship of worth INR 1.5 crores. The shortlisted Students will get the cash prize of INR 1.5 lacs. The last date to apply – 25th July 2019 at 5 p.m. This scholarship exam scheme is to be held in a variety of cities of Uttar Pradesh state. The syllabus of the exam is based on NCERT pattern. It covers the subjects like Grammar, General Study, General Science, and Mathematics. Then fill all the essential details in registration form such as name, father’s name, contact details, DOB, email Id, course details, etc. After filling all the details correctly, finally, press on submit button.